So that you can cut down on time and be more efficient with mail delivery, community mailboxes have replaced a lot of the individual mailboxes often found in mobile home parks and various areas where many families dwell. Delivering the mail in a location with many homes often creates a challenge for a letter carrier who isn’t going to have time to make individual stops at numerous homes using door-to-door distribution. Not only are the separate mailbox rows undesirable, they are not quite secure. This generates a potential problem, as they possibly can allow somebody to just walk up and go through your mail. To replace these unattractive rows of boxes, frequently of different colors and shapes, community mailboxes may be attached to poles or on solid walls. They are far better looking, while allowing access to all of the individual mailboxes by the mail carrier. A number of multi-user mailboxes are in use in buildings that have various businesses and allow protection to each individual user against spying eyes of other renters in the structure. Several have a tiny opening right in front whereby the tenants can easily see if they have anything in the mailbox worth opening. Nonetheless, they are rather secure for added protection. The residential areas with lots of residents living inside them can even get individual multi-user mail boxes which are generally mounted on poles or other structures. These may allow delivery to several users at once whilst keeping every individual user’s mail independent and safe and sound against theft by others. 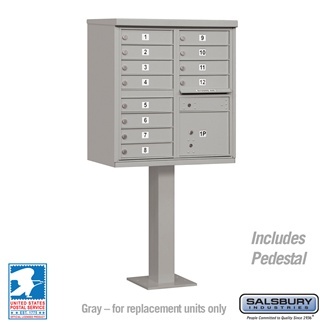 Cluster Box Units are ideal for community mailboxes for commercial and residential developments. These are typically particularly useful in large communities wherein tenants are constantly moving in and out, making it difficult for others to figure out if the person actually lives there or are simply just looking to steal other people’s mail. The USPS has strict requirements for all mail boxes, including those for multi-user deliveries and lots of manufacturers make their products much more resilient than necessary to offer extra protection. Most community letterboxes also provide another area for outgoing mail, open to the letter carrier, but not to the public. If you’ve ever lived in an apartment, odds are you’ve seen multi-user mailboxes built into the wall of your building’s common area that allows everyone to get into their mail with their special mailbox key. Once more, a separate outgoing mail section can be used to protect outgoing mail only the mail delivery person can access.